Evening Primrose Oil is an excellent source of gamma-linoleic acid (GLA), an essential fatty acid. Fatty Acids play a major role in the maintenance of healthy skin, cell membrane structure, cardiovascular and nervous system support. 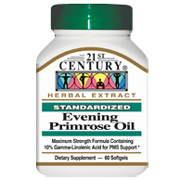 Evening Primrose Oil is used in Europe and Asia to aid the symptoms of PMS. Evening Primrose Oil contains the highest levels of GLA (10%). Our standardized herbal extracts are thoroughly tested to assure specific levels of the important active ingredients are present for maximum benefit. Take one (1) to three (3) softgels daily with meals for maximum daily results, or as directed by a medical practitioner. other ingredients: Gelatin, Glycerine, Punified water..
Evening Primrose Oil 500 mg is shipped in a discrete, unmarked package. Orders are processed immediately and usually take about 3 to 5 working days to be received. We do ask that you try it for 2 to 3 weeks to feel the full effects. Any information received is used only for order processing and shipping purposes. Your information, such as e-mail address, will never be disclosed to a third party.